Although IT pros like to have a choice when it comes to their infrastructure, the need to go fast makes that decision a bit more black and white. And therefore, instead of building an entire infrastructure from the ground up, more IT shops are opting to buy an integrated, converged system because it can go faster. In this exclusive e-guide, experts at VCE talk about the company moving forward after the purchase of VCE parent company, EMC. 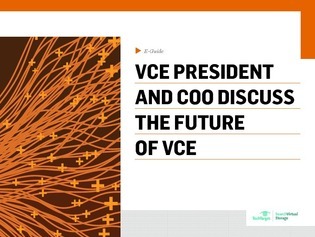 Read on as VCE President Chad Sakac discusses the future of VCE as he outlines plans for the company’s converged infrastructure products. Additionally, VCE COO Todd Pavone shares VCE’s converged infrastructure portfolio and strategy going forward as EMC’s main converged infrastructure business.